In 2006 has been produced sailboat Voyage 440 named Alboran Ron Punch (Majorca). This boat is available from base Palma de Mallorca in region close to Palma De Mallorca in Balearics. You can take in up to 10 crew members on the vessel Alboran Ron Punch (Majorca). Configuration of berths is 10 (8+2). There are 6 bedrooms located under she's deck. Alboran Ron Punch (Majorca) is equipped with 4 heads. Browse for our offer following this link: Catamarans Palma De Mallorca. Fuel tank is 400.00 l l. big , tank for water has up to 620.00 l liters. In this yacht is installed engine 2X40hp. With 13.36 m of lenght overall and 7.60 m of width Alboran Ron Punch (Majorca) offers enough space for comfortable sailing. Voyage 440 Alboran Ron Punch (Majorca) is equipped with: Anchor electric windlass, Dinghy, Bimini top, Gps plotter, Autopilot, Radar, Radio / cd player. . Nonrefundable caution there is 2500.00 EUR. 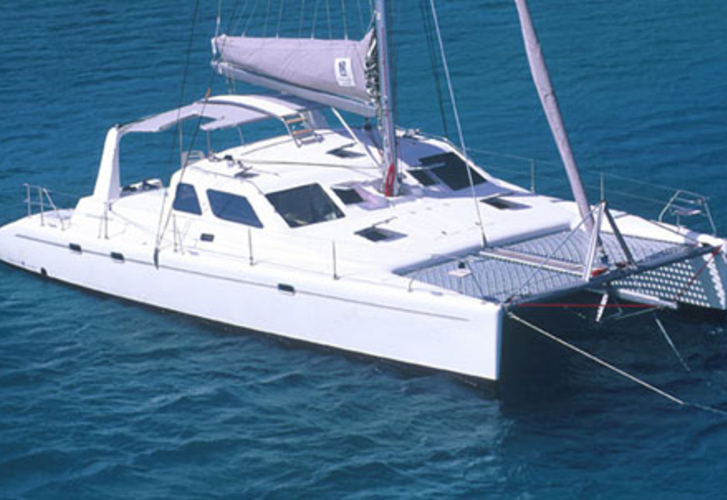 Analyze more offers following this link: Catamarans Palma de Mallorca.